I first heard about the Royal Bath and West Show a few years ago from my neighbour Judith, who helps out on one of the stalls in the ‘bee and honey’ tent at the show. With lots of local food and drink for me, and farm animals and tractors for my daughter, it sounded like the perfect day out for my family! I packed us all in the car and went to investigate the showground at Shepton Mallet in Somerset. We enjoyed it so much, we’ve been going every year since. The Royal Bath and West Show has quite a pedigree; it started in 1852 and is one of the oldest surviving agricultural shows in England. The only four-day show in the country, it doesn’t matter what day you go on, there is always a lot to see and do. Here are my top 5 highlights. There is so much to see, we usually follow the same route each year to make sure we don’t miss a thing. We start off walking through ‘Power of the Past’, a display of wonderful old steam engines and ornate gypsy caravans, and head to the Woodland Walk, where there are some fantastic craftspeople demonstrating rural crafts. My highlight is watching men carving whimsical wood sculptures using nothing but chainsaws. Next up are the Heavy Horses, where we sit and watch these enormous animals in the show ring, giving demonstrations of how they would have worked in days gone by. There are lots of stables where you can get up close and meet some of the horses too; I never cease to be astounded at how big they are! By this time we are usually getting a little peckish and ready for lunch. After a good handwash, we head into the multitude of food and drink tents that happen to be right by the Heavy Horses (good planning, eh?!). Obviously this is my favourite bit: a serious exploration of the huge array of delicious local food and drink on offer! I could spend hours in the food halls testing out all the cheeses, sausages and meats, ice creams, pies, ales, ciders, chutneys and chilli sauces (to name just a few). Most stalls offer you a ‘try before you buy’ taste of their wares, and if you are anything like me you’ll leave laden with scrummy treats. 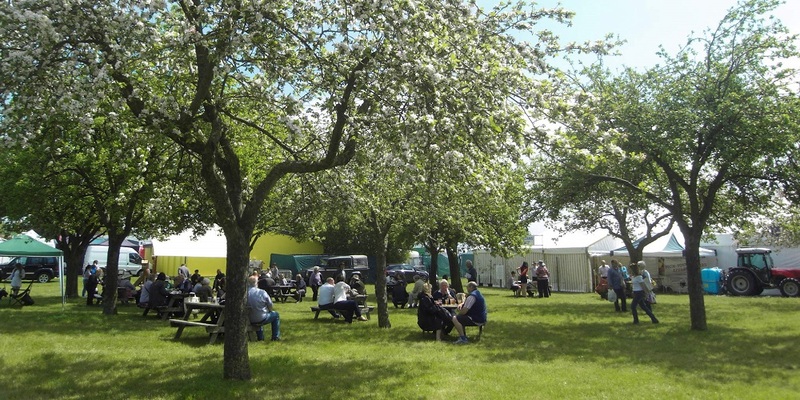 The Bath and West Show is also serious business for the cheese and cider makers; it’s home to the biggest cider competition in the world and the National Cheese Awards. People come from far and wide to the Bath and West Show, bringing cattle, pigs, goats, sheep, alpacas and more, to compete to be crowned ‘Best in Class’. You can get up close to the animals in their holding areas and then watch them in the show rings. There are also around 2,000 horses, ponies and riders competing over the four days, as well as world class sheep shearers. The Bath and West Show has a packed programme of demonstrations including beekeeping, cookery, sheep shearing and falconry. My daughter’s favourite bit is the ‘Farming for the Family’ area, where you can see farm animals such as calves, lambs, pigs and chicks, as well as cows being milked. I would definitely recommend this day out for young and old – children will especially love the tractors and farm animals, and the food halls are a must for everyone! Accessibility: Parking is on fields and there are hard footpaths around most of the show. Some tents and display areas are grassed. Disabled toilets. Would you like to stay on a farm? Check out our great range of farm holidays in the West Country and you could experience life on a working farm!